Frankfurt horizontal plane was first established at a World Congress on anthropology in Frankfurt, Germany in 1884. They decided that the eye/ear plane is most nearly parallel to the earth's surface. The Frankfurt plane is a line that passes from the bottom of the eye socket through the top of the ear opening. This is the plane in which the head is normally carried during life. The Frankfurt- mandibular plane angle [Figure - 1] is an angle formed by the intersection of the Frankfort horizontal plane and the mandibular plane. The significance of the Frankfurt- mandibular plane angle (FMA) to prosthodontic diagnosis, treatment planning and prognosis in class II malocclusions has been well documented. Angle (1899) classified the malocclusions based on occlusal relationships, considering the first permanent molar as the "key" of occlusion. Assuming that the maxillary first permanent molar was stable in the anteroposterior relationship with respect to the cranium, Angle based his classification on the mandibular position as defined by the lower first permanent molar with respect to the upper first permanent molar. In a Class II molar relationship, the lower first permanent molar is more posterior to the upper molar first permanent molar. Angle believed that this was a result of either a short, underdeveloped lower jaw or a posteriorly positioned mandible. The prevalence of class II malocclusions varies from 10% to 20% and depends upon age and ethnicity.,, This wide variation is due to the lack of agreement on what constitutes a malocclusion. Angle's classification system based on the horizontal relationship of the first molar, which may or may not be a true indicator of the skeletal relationship. The maxillae and/or mandible may have vertical growth characteristics that translate into size and positional discrepancies of the teeth, the jaws, or both. Frankfurt- mandibular plane angle estimation seems to be a more accurate method to determine which components of the dental and/or skeletal systems are most responsible for creating the class II malocclusion. However radiological cephalometry is limited by radiation exposure and the cost. Various facial goniometers are devised to overcome these disadvantages. However they are not available in all institutions. Recently digital computer graphics have contributed significantly for the facial assessment. The X-ray images are available as PACS (Picture Archiving Communication System) in all major teaching institutions. There are various softwares available for angle analysis. The screen calipers are a unique on-screen measurement tools. Pixel-perfect accuracy is ensured every time simply by aligning the Screen Caliper's pointers around an image. They resemble real life calipers in both form and function. Originally created for graphics and web professionals, the Screen Calipers are currently being used extensively for cephalometry. The availability of digital cameras at an affordable price has made study of facial geometry still easy and nowadays all audiovisual departments of teaching institutions possess digital equipments. [Figure - 2][Figure - 3] show on-screen FMA measurement using software Screen Protractor version 1.1 (available free for download from the site www.iconico.com on trial basis). Major graphic programs like Adobe Photoshop come with their own angle measurement tools. A normal range of Frankfurt-mandibular plane angle adopted by cephalometrists is 25±5 degrees. The vertical skeletal relationship is often described by the Frankfort Mandibular Plane Angle. A "high-angle" (open bite skeletal pattern) profile is one where the angle is 30 degrees or more and a "low-angle" (closed-bite skeletal pattern) is when the angle is 20 degrees or less. If the appositional growth of the alveolar processes and facial sutures exceeds the vertical growth from the mandibular condyles, the mandible will rotate posteriorly resulting in a high FMA. Conversely, if vertical growth at the condyles exceeds the sum of vertical growth components from the facial sutures and alveolar processes, the mandible will rotate anteriorly resulting in a low FMA. High FMA typically show a decreased biting force whereas a low FMA has an increased biting force. Low angle patients have infra-erupted teeth and usually are characterized by having small teeth. They are also predisposed to a decrease in VDO (Vertical dimension of occlusion). These patients are also more likely to return to the former occlusion if the VDO has been opened during treatment. The low angle patients require a more rigid prosthesis usually because of this. This is not evident in high angle patients. The increased biting force in these low angle patients causes more stress to the residual ridge. High FMA patients display the opposite characteristics. A high FMA usually shows an increase in the alveolar bone growth and a low FMA has a decrease in the bone growth. Low angle patients typically have flat, broad palatal vaults, shallow buccal vestibules, and high muscle attachments. High FMA patients are the opposite. Stability and retention may be a problem for the low FMA person. High FMA patients tend to exhibit an extension of the tongue, which may affect the wearing of different kinds of prosthetic appliances. A retracted tongue position related to the low FMA also needs to be addressed. In patients with high FMA, the upper lip often appears short and the smile line is high with considerable display of the incisor teeth and gingival tissue. Lip seal is difficult to obtain and the lower lip often exhibits a high level of mentalis activity. These patients are dolichocephalic (long head) and often are described as having the "long-face syndrome" with convex profiles. Furthermore, these patients generally present with more hypotonic muscles of mastication resulting in decreased bite force. Patients with a low FMA are brachycephalic (short head) and present with a skeletal deep bite and a less convex facial profile. Overclosure of the mandible often results in an averted lower lip and deep labiomental sulcus. The upper lip appears long, limiting the display of teeth and gingivae. The curve of Spee is often accentuated due to lack of incisal contact leading to supra eruption and a deep vertical overlap of the anterior teeth. More residual ridge resorption may be evident in patients with a low FMA. Tallgren reported considerably more alveolar bone loss for edentulous patients with a low FMA over a 25 year period. Because patients with low FMA's often have well-formed mandibles with limited vertical bony height and shallow vestibules, residual ridge resorption (RRR) can be clinically significant with time. A contributing factor to RRR could be the potentially greater and more vertically directed forces of mandibular closure seen in skeletal class II patients with a low FMA. 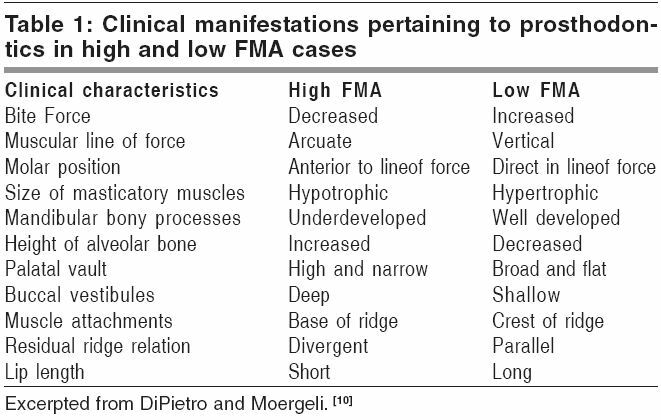 The clinical manifestations pertinent to prosthodontics in high- and low-angle (FMA) patients are shown in [Table - 1]. Centric jaw relationship is a reproducible position that is used to articulate edentulous casts. The artificial teeth are set so that maximum intercuspation occurs at this position. Many different methods have been described for recording CR. They may be classified as static or functional [Table - 2]. Most methods are capable of giving accurate results but functional techniques such as 'chew-in' techniques are not commonly used. The most common is the use of interocclusal wax occlusal rims. Recording centric relationship can be difficult for skeletal class II patients, especially patients with a high FMA., Directing the patient to position their tongue posteriorly while completing a centric relation record will facilitate the recording of a more retruded position of the mandible. The mandibular posterior denture teeth should be positioned over the edentulous ridge, and adjustments made with the maxillary occlusal table. Some type of tooth or resin veneer may be necessary to extend the occlusal table either facially (for esthetics) or lingually (for function). Some authors advocate the use of palatal-lingual ramps or a buccal facade of tooth-colored acrylic resin added to the maxillary posterior denture teeth to increase the occlusal table palatally or to improve esthetics by establishing proper lip support. Obtaining multiple occlusal contacts is an important goal with class II patients. At rest, most skeletal class II patients will posture the mandible in a more anterior position, primarily because of esthetics. Positions other than centric relation are usually not repeatable if the patient is edentulous in either arch and tooth guidance has been lost. Therefore, multiple occlusal contacts are essential both in centric relation and eccentric positions for the stability and comfort of the prostheses. This is especially important for skeletal class II patients with a low FMA. Comfort with the prostheses can be a problem because of limited aligned space available for support and the potential for more forceful closure. Lingualised occlusion scheme has been suggested in patients with high FMA. In conventional artificial tooth arrangement the lower artificial buccal cusps occlude with the fossae of the opposing upper teeth. The upper palatal cusps occlude with the fossae of the lower teeth. In a so-called lingualised occlusion, the lower buccal cusps are cut back so that there is only contact on the upper palatal cusps. This scheme allows the ease of obtaining a balanced occlusion comparable with the use of zero cusped teeth, together with the advantage of retaining posterior tooth cusp form and therefore a pleasing appearance. An average value articulator can be used with good results. However, in order to produce dentures with a balanced occlusion/articulation that should need minimal adjustment at insertion, a semiadjustable articulator together with the use of a facebow, and lateral and protrusive transfer records, should be considered. Some patients with skeletal class II malocclusion are prone for snoring and sometimes, development of airway obstruction during sleep (Obstructive Sleep Apnoea -OSA). Various types of anterior advancement devices are available; both patented and custom made, variable and fixed. These appliances modify the upper airway by changing the posture of the mandible and tongue. They are not only helpful in preventing sleep apnoea, but also snoring is improved and often eliminated in almost all patients. Categorisation of class II skeletal malocclusion based on FMA is clinically important and has its own prosththetic implications. Patients with low FMA angles depict an increased biting force, infra-erupted teeth, small teeth, and are predisposed to a decrease in VDO and alveolar bone loss. Determination of FMA in the present days can be easily achieved by facial digital imaging at an affordable cost without exposing the patient to radiation. Treatment planning should focus on recording centric relationship, positioning of mandibular posterior denture teeth, providing adequate freedom of movements and multiple occlusal contacts. Those with airway symptoms can be benefited from mandibular splints. Ranke J. Verst@ndigung gber ein gemainsames cranio-metrisches Verfahren (FrankfurterVerst@ndigung). Archiver Anthropologie 1884;15:1-8. Angle EH. Classification of malocclusions. Dental Cosmos 1899;41:248-64,350-7. Proffit WR, Fields HW Jr, Moray LJ. Prevalence of malocclusion and orthodontic treatment need in the United States: estimates from the NHANES III survey. Int J Adult Orthodon Orthognath Surg 1998;13:97-106. Saleh FK. Prevalence of malocclusion in a sample of Lebanese school children: an epidemiological study. East Med Health J 1999;5:337-43. Onyeaso CO, Aderinokun GA, Arowojolu MO. The pattern of malocclusion among patients seen in Dental Centre, University College Hospital, Ibadan, Nigeria. Afr J Med Med Sci 2002;31:207-11. Moyers RE. Handbook of orthodontics. The Year Book Publishers Inc: Chicago; 1960. p. 99-129. Moyers RE, Riolo ML, Guire KE, Wainright RL, Bookstein FL. Differential diagnosis of class II malocclusions. Am J Ortho 1980;78:477-94. Donald AC, Thomas AC, Paul M. Kasrovi. Occlusal Considerations for Partially or Completely Edentulous Patients with Class II Skeletal Malocclusions. Prosthetic Dentistry Review. Spring 1999:2;1. Neger M. The facial goniometer: an instrument for the direct measurement of the Frankfort-mandibular plane angle and the gonion angle. Angle Orthod 1951;21:198-204. DiPietro GJ, Moergeli JR. Significance of the Frankfort-mandibular plane angle to prosthodontics. J Prosthet Dent 1976;36:624-35. Tallgren A. The continuing reduction of the residual alveolar ridges incomplete denture wearers: a mixed-longitudinal study covering 25 years. J Prosthet Dent 1972;27:120-32. Hardy IR, Passamonti G. A method of arranging artificial teeth for class II jaw relations. J Prosthet Dent 1963;13:606-10. Curtis TA, Langer Y, Curtis DA, Carpenter R. Occlusal considerations for partially or completely edentulous skeletal class II patients, Part I: background information. J Prosthet Dent 1988;60:202-11. Pancer J, Al-Faifi S, Al-Faifi M, Hoffstein V. Evaluation of variable mandibular advancement appliance for treatment of snoring and sleep apnea. Chest 1999;116:1511-8. Clark GT, Sohn JW, Hong CN. Treating obstructive sleep apnea and snoring; assessment of an anterior mandibular positioning device. J Am Dent Assoc 2000;131:765-71.